Home » Columns » No 15 days to purchase majority! The Strong Man heading The Strong Party used all his strength to make things move his way. There were serial IT raids on “Congress moneybags,” even a last-minute raid on a resort in Badami where Congressmen heading Siddharamaiah’s campaign were lodged. The Central Government’s partisan role reached an absurd limit when Congress MLAs headed for Kochi found that civil aviation authorities would not permit their flight to take off. How childish can arrogance get. The ones who had wealth have been ruling in solitary splendour since the demonetisation of the beloved rupee. It enabled them to wear a false mask and win honours. They became kings who ruled over the dispensers of justice as well. But the men of justice, reared in a different kind of discipline, had a tendency to show their mettle now and again. It was left to them to expose Karnataka’s RSS Governor. The man had ignored his oath to the Constitution and given the BJP, the party without a majority, an unheard-of 15 days to purchase a majority. That was 15 days to buy and sell horses; 15 days for Central Government agencies to raid and intimidate MLAs; 15 days to flaunt Rs.100-crore baits (or was it 200 crore?) The farce decreed by the gubernotorious swayam sevak made the men of justice go into action. They decreed that the party with no majority must test the floor in two days instead of 15. That turned out to be the decisive factor in what was becoming a travesty of electoral democracy in Karnataka; it stopped the politicians from playing a cheating game. Now that people are kings, how do we guard ourselves from our own people and from others? 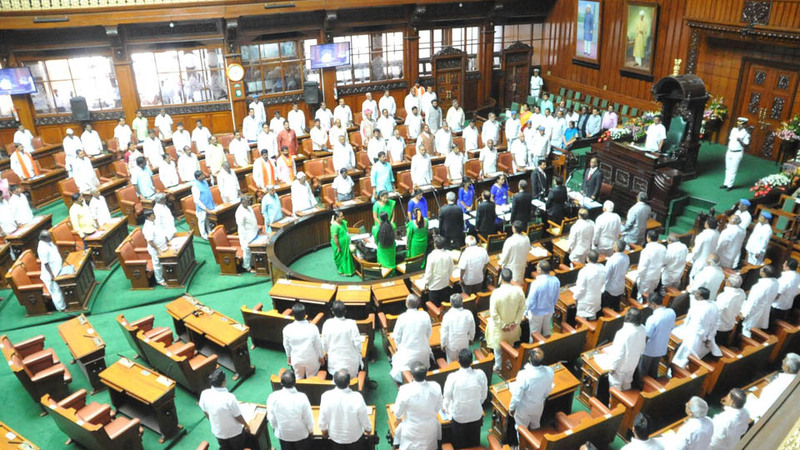 Some imperatives arise from factors which now stand proved by the dramatic twists in Karnataka. The BJP juggernaut is not unstoppable. The juggernaut needs to be stopped because it is splitting people along communal lines and institutionalising a culture of everyday violence in the name of what people should eat, say, study and think. India is too diverse a society to survive as a monolithic entity. The Congress has neither the leadership nor the infrastructure to stand on its own legs. A combination of regional parties and the Congress is the way forward. The Congress-JD(S) union that has gained traction in Karnataka must expand and multiply across the country, with common development programmes that will avoid politics of hatred and intimidation. And for starters, can we bring the institutions that have sustained our democracy back to their wonted glory — the judiciary, the civil service, the CBI, the Election Commission? Steps like these would start giving hope to the people hiding in dark caves waiting for their days of misery to end. Barking DOG barks again …..no no , starts howling again! So,according to George,the IT raid on DKShi’s home that was aired on all tv channels with roomful of high denomination currency notes was manufactured by BJP? I think people like George are an insult to human beings! That raid was shown on tv channels alloger India with and that show ran for 3 days! Yet he is considered clean? Congress is like Ganges! How many corpses may be dumped there, Congress like Ganges is conside red clean and holy! Let’s come to this point of CM of Karnataka! If two losers who lost the election individually can pool their numbers and forma government!? Then,what ever happened to people’s will? Then, from he same logic,if BJP gets 45 percent votes in next election and opponents like SP, cPM, CPI, RJD, congress, ADMK, DMK, 20 splinter parties in Assam, orissa, Karnataka, AP, Telangana, and 3 independents get a total of 55 percent, they get to be the pm? It is high time this author gets done psychiatric help ! As long as the Davegowda family in Karnataka and The India Gandhi family are involved in politics they will work hard to keep India backward and weak. It is a disgrace that the so called “objective” journalist T S George defends this cabal.